Share your Christmas Spirit by helping us raise money to donate 38 (#6+16×2) bikes through the Concord Knights of Columbus, who will help us get them to kids of financially troubled families in our area. We are deeply saddened by the passing of a saint, Bonnie Martin. Take comfort that she was able to end her 3 year battle with cancer in peace and grace, and now joins her son and the Angels in heaven. This was always a cherished event for her, and continues to live on. Bike’s to be built still arrive with Her name on them 🙂 May this years drive be a touching memorial and testament to all she did to make the lives of so many people, young and old, happy and better. Please join us. There is so much Peace in giving. I AM SO THANKFUL FOR MIKES BIKES AND I KNOW HE IS SMILEING DOWN KNOWING HIS FAMILY IS DOING THE RIGHT THING AND HELPING KIDS OUT!!! I CANT WAIT TO SEE MY CHILDRENS FACES CHRISTMAS DAY WHEN THEY WAKE UP AND SEE THE NEW BIKES THIS ORGANIZATION HAS GAVE TO THEM!! IN THE FUTURE I AM DETERMINED TO DONATE WHAT I CAN TO THEM SO THEY CAN CONTINUE TO HELP NEEDY KIDS AND FAMILIES OUT THAT NEED IT!!! THANK YOU AGAIN MIKES BIKES FOR MAKING CHRISTMAS HAPPEN FOR ME THIS YEAR AND MAKING ONE WISH ON MY CHILDRENS LIST COME TRUE..YOU GUYS ARE TRULY ANGELS AND I CANT THANK YOU ENOUGH!!! PICTURES WILL BE POSTED AFTER CHRISTMAS WITH THE KIDS AND THERE BIKES!!! But on a little happier note I have to give a big shout out to [Michael J’s sister] Tabatha Lorene she worked magic and the 2 little boys I told u was getting nothing for Christmas will be getting a bike .. My dad went and picked them up. 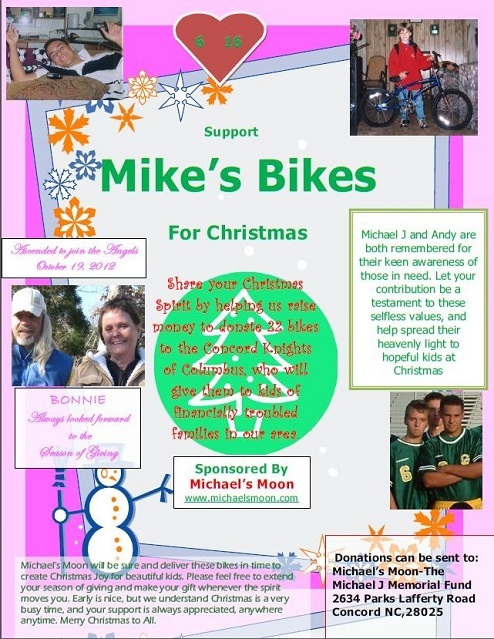 Mike’s Bikes you are amazing and when I called there mom she cried she said my kids have something from Santa.. This is what Christmas is about.. All they r getting is the bike and there blessed. Thank u Tabby you are a awesome friend of mine..